I rarely go in for crockpot cooking. Everyone waxes poetic about how easy it is, how much it saves your life, and how it’s basically the best thing since sliced bread. But I guess I just don’t get it. I mean, I don’t hate crockpots. But I just haven’t had amazing luck with them. I mean, everything’s so…soggy. 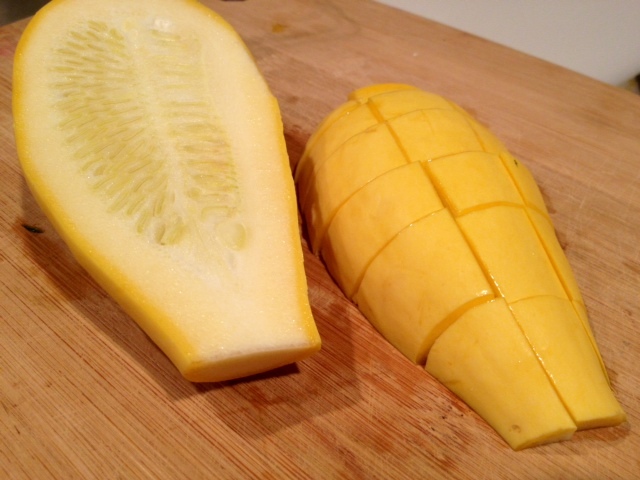 But every so often I run across a recipe that makes me want to give it another shot. 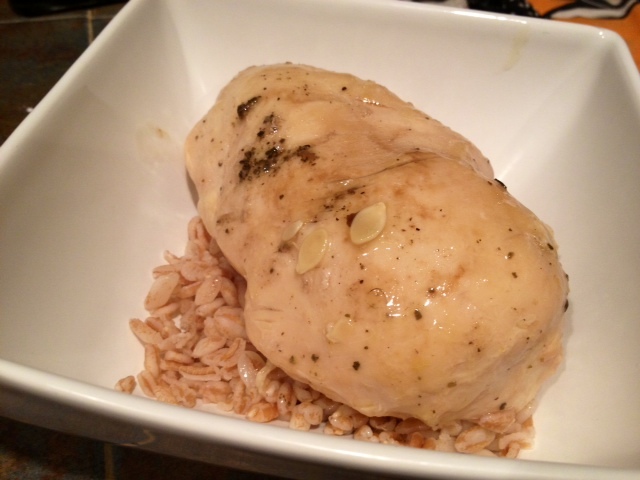 I’d had this recipe bookmarked for a while, and overall I really like it. 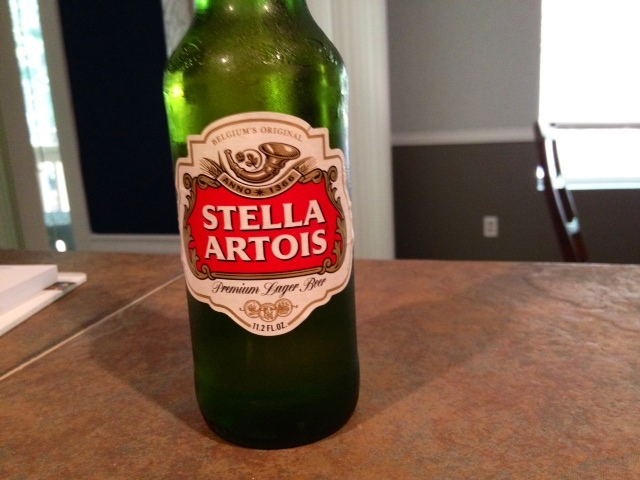 I do think it would be a little better with a darker beer (I tend toward stouts and darker beers like Negra Modelo), but I used something sitting in my fridge that I wasn’t going to be as likely to drink. The recipe didn’t call for any veggies, but I added them anyway. 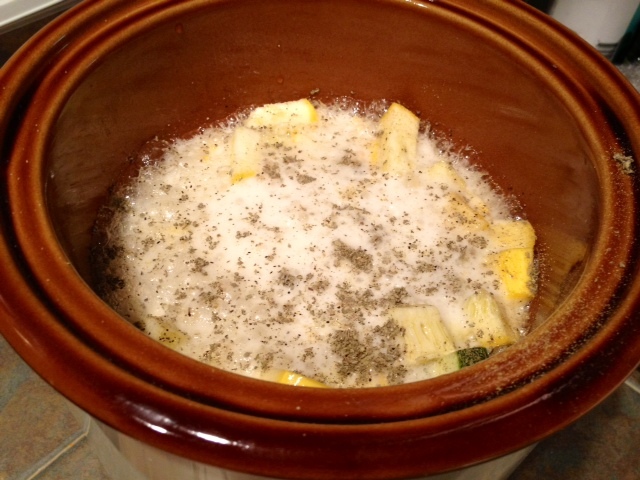 If you have the time, it would probably be better to add the zucchini and squash to the slow cooker more like a half-hour before you’re ready to serve, since then they’ll still retain some crunch—as it is, they were practically transparent and fairly mushy. I didn’t mind but I’d probably change that next time. You can add whatever veggies you have around, it’s a super versatile recipe. 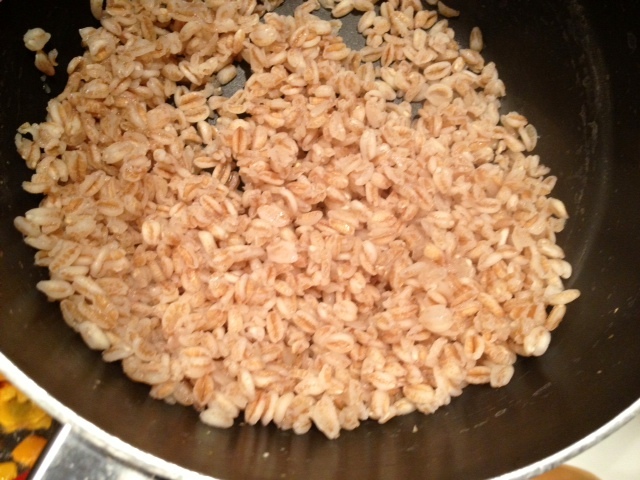 I also cooked up some farro to use as a base for the recipe. It didn’t call for it, but it seemed a shame to waste all that tasty sauce. You can use anything you have on-hand—rice, quinoa, pasta, whatever. 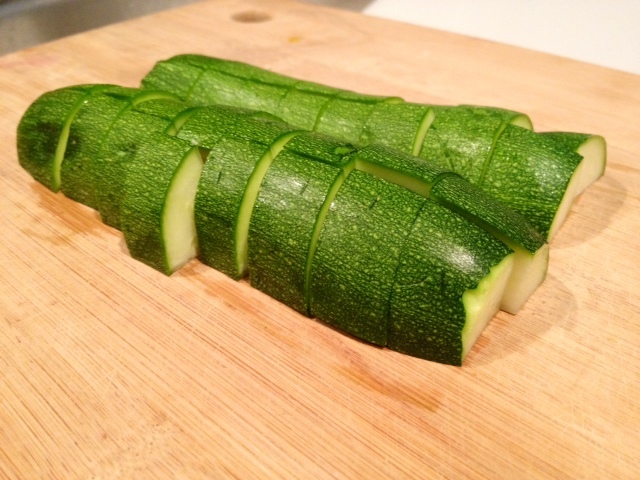 Cut up your veggies. Like I said, I’d maybe wait and add them until the end next time, but either way works. 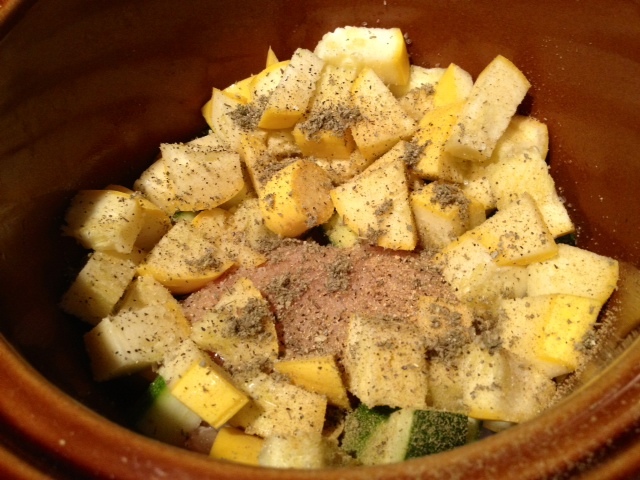 Lightly spray your crockpot with non-stick cooking spray. 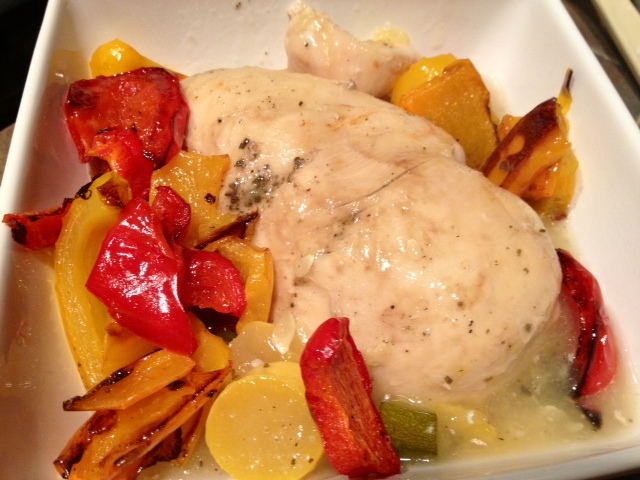 Lay the chicken breasts in the bottom, then pile the veggies on top and sprinkle with the spices. I didn’t have the dried oregano the recipe called for, so I used rubbed sage, rubbed thyme, and of course garlic powder, salt, and pepper. Pour in the whole bottle or can of beer. Cook on high for 4-5 hours, or if you’re going to be gone longer put it on low for 6-8 hours. About a half hour before you’re ready to serve, stir up the cornstarch with a little lukewarm water and stir into the crockpot to help thicken the sauce. Also, cook up whatever grain or pasta you’re using for a base. This is my lovely cooked farro. Ladle the sauce and veggies on top of the grains and chicken. 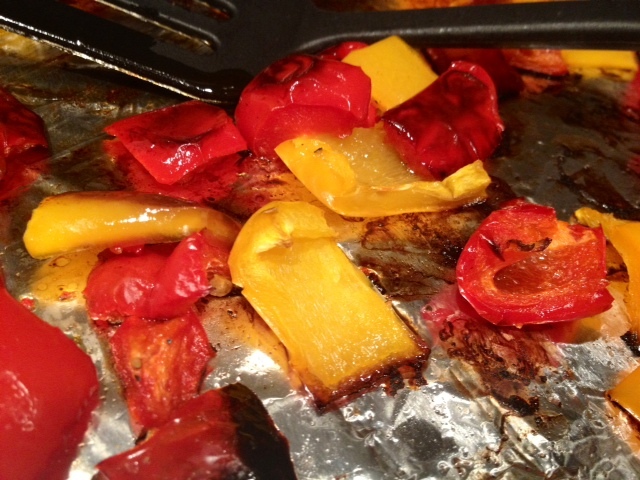 I roasted up some peppers as well, but just threw them on top (so they kept their lovely crispiness). Et voila! 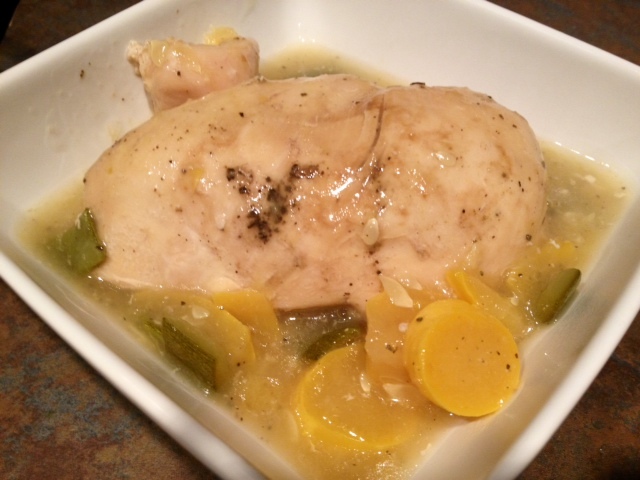 Recipes like these definitely make me see the value of using the crockpot sometimes. It was simple, tasty, and gave me some good leftovers for the rest of the week. 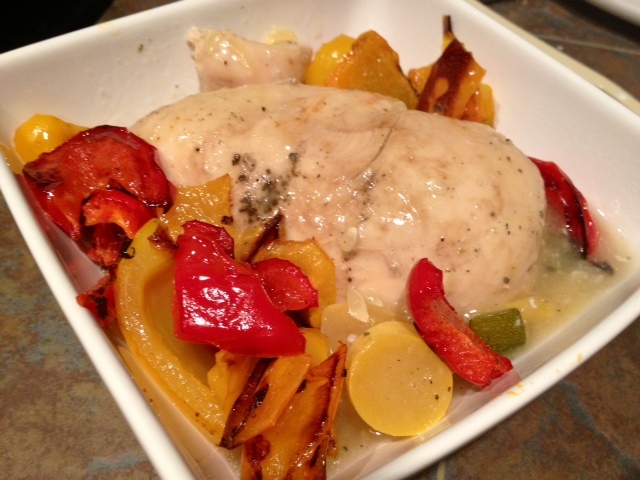 And I didn’t have to mess with the raw chicken at all, which is always a plus in my book! 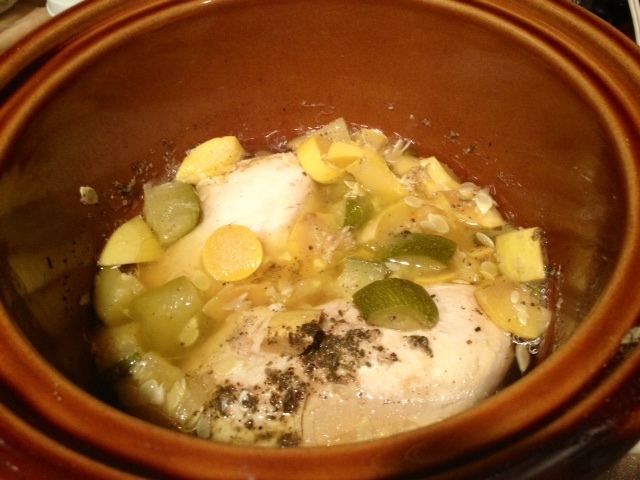 Place all ingredients in the crock pot, and cook on high for 4-5 hrs, or low for 6-8 hrs. If you don’t wand the zucchini and squash to get super soft, wait to add them until about half an hour before you’re ready to eat. Serve over rice, pasta, or some other grain so you get the full punch of the sauce. Keeps in the fridge for up to a week.